Sarah’s Inn is honored to welcome featured speaker Pulitzer Prize winning poet Natasha Trethewey on Wednesday, May 29, at 8:00 a.m. for this second event in our annual series. A two-term U.S. Poet laureate, a Pulitzer Prize winner for her 2006 poetry collection, Native Guard, Trethewey is the author of five collections of poetry and a non-fiction book. A Board of Trustees Professor of English at Northwestern University, Trethewey lives with her husband in Evanston, IL. Born in Mississippi, her poetry is deeply rooted in history, and her latest collection, Monument, focuses on the trauma of our shared history and her personal trauma of losing her mother, Gwendolyn, at the age of 19, when her mother was murdered by her second ex-husband, Trethewey’s stepfather, after years of domestic violence. Ms. Trethewey offers an inspirational and thought provoking view of domestic violence. Through the healing power of her poetry, Natasha connects us all through a message of resilience and hope, and motivates us to take action by finding strength from the past to be agents of change in driving a culture shift to create safer communities and workplaces. 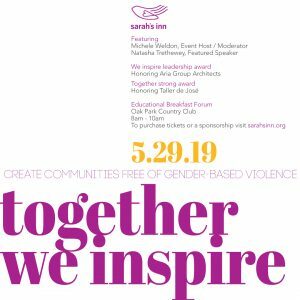 Together We Inspire will be hosted and moderated by Michele Weldon, an award-winning journalist and author of five nonfiction books, emerita faculty in journalism at Northwestern University Medill School of Journalism, and Director of the Northwestern Public Voices Fellowship for the OpEd Project. Weldon is the mother of three sons and lives in River Forest. When: Wednesday, May 29, 2019 / 8:00 a.m. – 10:00 a.m.